With a handful of well-established players that account for key market share, global artificial limbs market is highly consolidated in nature, states Transparency Market Research (TMR) in a new report. Technological advances and high prices of top of the line products are attracting small players to enter this market. This is predicted to lead to intense competition in the market. Some of the key companies currently operating in the global artificial limbs market are RSL Steeper Group Ltd., Hanger Inc., Spinal Technology Inc., Optimus Prosthetics, and PROTEOR. 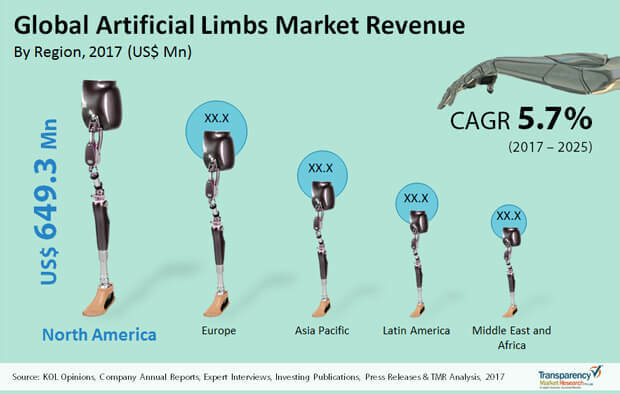 Over the forecast period between 2017 and 2025, the demand in the global market for artificial limbs is expected to translate into a revenue of US$2,869.3 mn by 2025 rising from US$1,750 mn in 2016. If the figures hold true, the market will display a steady 5.7% CAGR over the forecast period. Technology-wise, the segment of myoelectric or electrically powered artificial limbs is anticipated to display the leading demand; the segment held a substantial 41.7% market share in 2016. Myoelectric artificial limbs are suitable for a high degree of customization and enable higher number of options for better grip that are collectively propelling this segment. Geography-wise, North America is seen to witness continued dominance as consumers are highly aware of advanced medical devices such as artificial limbs, along with active governmental support for research and development of new products. This, along with high healthcare expenditure and swift uptake of advanced technology for artificial limbs are serving to boost this regional market. There are several factors driving the artificial limbs market. First and foremost, artificial limbs address the limitations of mechanical assistance devices used for amputees to perform day to day activities. As per statistics of the National Limb Loss Information Center, approximately 1.7 million individuals live with limb loss in the U.S. Mechanical assistance devices enable limited movement of limbs and are mostly expensive. On the other hand, artificial limbs that are made of specialized materials such as Kevlar, titanium, and carbon fiber allow better movement because of their low weight and high strength. These materials also enable improved limb control with reduced pain. With continual research, new technologies and new materials have led to the development of improved products that are more adaptable. Silicone, urethanes, and mineral based liners offer much more flexibility, lightweight, and comfort over conventional materials. These advanced materials display ‘memory’ feature that allows them to respond as per the degree of pressure. Furthermore, technological advancements such as CAD/CAM technology that allows to cater to individual requirements is serving to provide immense opportunities for players in this market. The rising incidence of osteoarthritis is creating new growth avenues for this market. Technological advancements such as digital control and robotic artificial limb are some new trends that have come to the fore in this industry. Additionally, novel movement in artificial limb technology such as development of artificial limbs integrated circuits that can act based on electrical impulses in the body are expected to offer augur well for the artificial limbs market over the coming years.